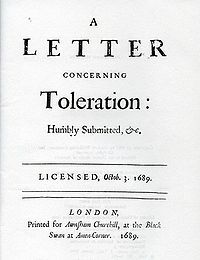 Title page of the first edition of A Letter Concerning Toleration. In the wake of discovery of the Rye House Plot and Charles II's persecution of the Whigs, Locke fled England to Amsterdam, Holland in September 1683. Throughout his life, Locke had taken an interest in the debate about religious toleration. The question was much debated in Holland during Locke's stay and in October 1685 Louis XIV of France Revoked the Edict of Nantes that had guaranteed religious toleration for French Protestants. One of the founders of Empiricism, Locke develops a philosophy that is contrary to the one expressed by Thomas Hobbes in Leviathan, in supporting toleration for various Christian denominations. Hobbes did allow for individuals to maintain their own religious beliefs as long as they outwardly expressed those of the state, however, and it has been argued that Locke's rejection of Catholic Imperialism was the ultimate basis for his rejection of government's interest in spiritual salvation. Unlike Hobbes, who saw uniformity of religion as the key to a well-functioning civil society, Locke argues that more religious groups actually prevent civil unrest. Locke argues that civil unrest results from confrontations caused by any magistrate's attempt to prevent different religions from being practiced, rather than tolerating their proliferation. Locke's primary goal is to "distinguish exactly the business of civil government from that of religion." He seeks to persuade the reader that government is instituted to promote external interests, relating to life, liberty, and the general welfare, while the church exists to promote internal interests, i.e., salvation. The two serve separate functions, and so, must be considered to be separate institutions. For Locke, the only way a Church can gain genuine converts is through persuasion and not through violence. This relates to his central conclusion, namely, that the government should not involve itself in care of souls. In support of this argument he presents three main reasons: (1) individuals, according to Locke, cannot divest control over their souls to secular forces, as God does not appoint the magistrate; (2) force cannot create the change necessary for salvation, because while it can coerce obedience, it cannot change one's beliefs; and (3) even if coercion could persuade someone of a notion, it would not help with ensuring salvation, because there is no reason to believe that magistrates are reliable judges of religious truth. Locke argued that those who believed that "faith need not be kept with heretics" and that "kings excommunicated forfeit their kingdoms" had "no right to be tolerated by the magistrate". Neither did "those who refuse to teach that dissenters from their own religion should be tolerated". This was because those who believed such doctrines would, given the opportunity, attack the laws and the liberty and property of the citizen. These people, Locke argued, sought religious toleration "only until they have supplies and forces enough to make the attempt" on liberty. The doctrines that "faith need not be kept with heretics" and that "kings excommunicated forfeit their kingdoms" were commonly held to be Catholic beliefs by Protestants. During his visit to France in 1676, Locke recorded that the belief that "faith does not have to be kept with heretics" was an important factor in the intolerance shown to the Protestant Huguenots. "That church can have no right to be tolerated by the magistrate," Locke argued, "which is so constituted that all who enter it ipso facto pass into the allegiance and service of another prince". If this were to be tolerated, "the magistrate would make room for a foreign jurisdiction in his own territory and...allow for his own people to be enlisted as soldiers against his own government". This has been interpreted by historians as a reference to the Catholic Church, with the Pope being the prince to whom Catholics owed allegiance. However, more recently scholars have challenged the idea that Locke opposed the toleration of Catholics in all circumstances. Mark Goldie argues that the traditional interpretation of Locke's position on Catholics "needs finessing, since he did not, in fact, exclude the theoretical possibility of tolerating Catholics...if Catholics could discard their uncivil beliefs, they could then be tolerated". Goldie asserts that Locke was opposed not to Catholicism as such but antinomianism, the belief that ordinary moral laws are superseded by religious truth. Scott Sowerby also claims that Locke left open the possibility that Catholics could be tolerated if they adopted tolerant principles and rejected political allegiance to the Pope. John Marshall has argued that a number of passages in the Letter demonstrate that Locke believed that Catholics "in their terms of worship and religious speculative beliefs...deserved their worship to be free". Marshall also notes that "The combination of Locke’s comments in the Letter suggest that during [its] composition ... Locke was once again struggling over how to discriminate between the series of associated political principles which for him made Catholics intolerable, and the religious worship and other religious beliefs of Catholics which deserved toleration." Locke argued that atheists should not be tolerated because "Promises, covenants, and oaths, which are the bonds of human society, can have no hold upon or sanctity for an atheist". There is, however, a passage added in a later edition of the Essay concerning Human Understanding, where Locke perhaps questioned "whether 'atheism' was necessarily inimical to political obedience." Toleration is central to Locke's political philosophy. Consequently, only churches that teach toleration are to be allowed in his society. Locke’s view on the difficulty of knowing the one true religion may suggest that religion is not personally important to Locke, but it also may point to the deep uncertainties surrounding religious belief in a time of political and intellectual conflict. In contrast, Locke’s view on atheism suggests that he was far from considering religion as unimportant. As an empiricist, he took practical considerations into account, such as how the peace of civil society will be affected by religious toleration. A close reading of the text also reveals that Locke relies on Biblical analysis at several key points in his argument. There were immediate responses from the High Church Anglican clergy, published by Thomas Long and Jonas Proast. Long believed the letter was written by an atheistically disguised Jesuit plot for the Roman Catholic Church to gain dominance by bringing chaos and ruin to church and state. Proast attacked the Letter and defended the view that the government has the right to use force to cause dissenters to reflect on the merits of Anglicanism, the True Religion. Locke's reply to Proast developed into an extended, controversial exchange. ^ A Letter Concerning Toleration by Locke, John; Tully, James H.
^ Raymond Klibansky, 'Preface', in Klibansky and J. W. Gough (eds. ), Espitola de Tolerantia/A Letter on Toleration (Oxford: Clarendon Press, 1968), p. vii. ^ Maurice Cranston, John Locke: A Biography (Oxford: Oxford University Press, 1985), pp. 227-230. ^ Klibansky, p. x, pp. xvi-xvii. ^ Klibansky, pp. viii-ix, p. x, pp. xvi-xvii. ^ E. C. Graf, 2007: Cervantes and Modernity: Four Essays on Modernity, Bucknell University Press, pp. 141-55. ^ Klibansky and Gough, pp. 131-33. ^ John Marshall, John Locke, Toleration and Early Enlightenment Culture (Cambridge: Cambridge University Press, 2006), pp. 690-91. ^ Klibansky and Gough, pp. 160-61. ^ Mark Goldie (ed. ), A Letter Concerning Toleration and Other Writings (Indianapolis: Liberty Fund, 2010), p. 50, notes 127 and 128. ^ John Lough (ed. ), Locke's Travels in France, 1675-9: As related in his Journals, Correspondence and other papers (Cambridge: Cambridge University Press, 1953), p. 20. ^ Klibansky and Gough, p. 133. ^ J. W. Gough, 'Introduction', in Klibansky and Gough, pp. 3-4. ^ J. W. Gough, John Locke's Political Philosophy: Eight Studies (Oxford: Clarendon Press, 1973), p. 197. ^ Scott Sowerby, Making Toleration: The Repealers and the Glorious Revolution (Cambridge, Massachusetts: Harvard University Press, 2013), p. 256. ^ Mark Goldie, 'Introduction', in Goldie (ed. ), A Letter Concerning Toleration and Other Writings, p. xix. ^ Klibansky and Gough, p. 135. Maurice Cranston, John Locke: A Biography (Oxford: Oxford University Press, 1985). Mark Goldie (ed. ), A Letter Concerning Toleration and Other Writings (Indianapolis: Liberty Fund, 2010). J. W. Gough, John Locke's Political Philosophy: Eight Studies (Oxford: Clarendon Press, 1973). Raymond Klibansky and J. W. Gough (eds. ), Espitola de Tolerantia/A Letter on Toleration (Oxford: Clarendon Press, 1968). John Marshall, John Locke, Toleration and Early Enlightenment Culture (Cambridge: Cambridge University Press, 2006). Scott Sowerby, Making Toleration: The Repealers and the Glorious Revolution (Cambridge, Massachusetts: Harvard University Press, 2013).